Would you like to know how to create a website with www.sitementrix.com? Would you like to learn how to use all possibilities of the SiteMentrix online website Builder and Content Management System (CMS)? In this hands-on book, you'll read how you can. How to create a website using the online Builder: how to make the webdesign by combining the design possibilities, for example: menu style, font, upload a logo banner. You'll learn how you can manage the content of your website using your browser: how to change the menu and how to create and edit pages. You'll learn how you can write and layout text using the online editor, and how you can upload and insert photo's. How to embed a YouTube movie. How to make a link. How to make a form. Guestbook module: how to make a guest book. Photobook module: how to make an photobook online. Contactbook module: how to make an internet contactbook. FAQ module: how to make and publish Frequently Asked Questions (and answers!). How to setup your SiteMentrix website for Google AdSense: You'll learn how you can display Google ads in your SiteMentrix website and share the revenues by joining the Google AdSense program. How to setup your SiteMentrix website for Google Webmaster Tools. How to setup your SiteMentrix website for Google Analytics, for monitoring visitor statistics. You'll learn how to create a webshop: make a web store with the online order form and PayPal cart. This enables you to sell products, services and content on your SiteMentrix webshop; your customers pay you with PayPal. 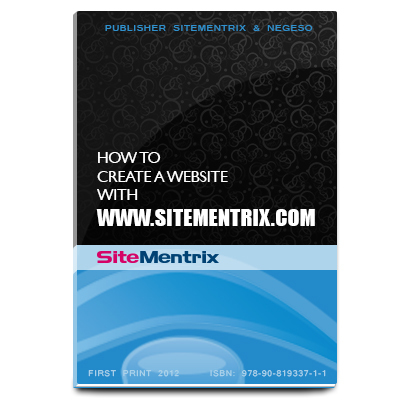 This book is indispensible for anyone who owns a SiteMentrix website or would like to create a website. SiteMentrix is an online Website Builder and Content Management System. Rating 5/5 (average) based on 500 reviews. I created my website online using the online builder. It was so easy, just choose from the available design options for menu, font, colors and so forth. For our music band, I wanted an easy to manage website with a guest book. With SiteMentrix, an online guest book is standard. Handling order faxes was becoming a nightmare. So we switched to SiteMentrix and created several online order forms (easy btw). Error rates dropped dramatically and delivery speed increased. With SiteMentrix it is easy to manage the contents of your website online!